The inscription J Wheeler appears once on the Newbury town memorial and a John Wheeler is remembered on the splendid memorial in the URC Church, Newbury. 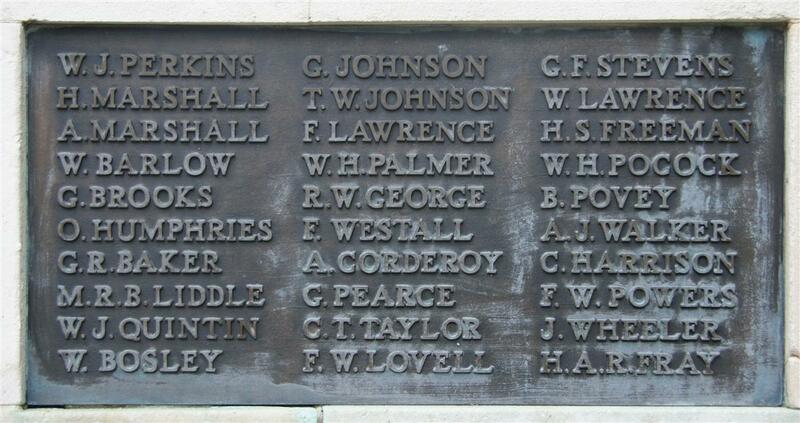 John Wheeler's name on Newbury War Memorial (lower right)- but which John Wheeler? However, there are two John Wheelers from Newbury listed in the Commonwealth War Graves Commission’s roll of the dead of WWI. Both J Wheelers served with the Royal Navy, not as sailors but as infantrymen on the western front. The first to die was John Wheeler the son of James and Annie Wheeler of 14 Hampton Road, Newbury. He died on17 February 1917 while serving with the Howe Battalion of the Royal Navy Division. The other John Wheeler was the son of Mrs Mary Wheeler of 6 Rosebery Place, Greenham Road, Newbury. He died on 28 April 1917 while serving with the Royal Marine Light Infantry. With further research it may prove possible to determine which of these two was a Congregationalist and hence the man remembered on the memorial in the URC Church. This would then suggest that he would be the most likely of the two to appear on the town memorial (it appears that the town memorial contains an aggregation of names from pre-existing parish, school, etc memorials plus additions). However, unless some new evidence comes to light, it is impossible to determine which is really the man on the town memorial. However, both are worthy of commemoration and both of their stories will be told here when the background research is completed.